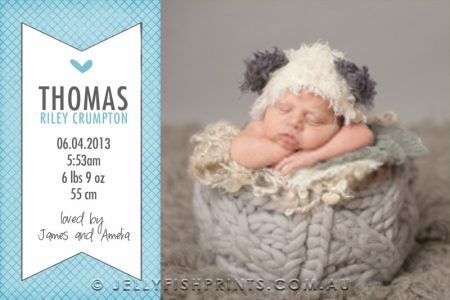 This lovely baby boy announcement card design is perfect to announce the arrival of your brand new baby. Welcome your little one into a word of love and keep your card as a special baby keepsake. Just add your photograph of your baby and personalise your wording. Welcome little one into the world. We will create a beautiful baby boy announcement card for your brand new bundle of joy. This card will feature a photo or your little boy set upon a slightly textured blue background. We also have a green sample but can cater to your colour choice easily. You will need to provide us the measurement for your baby including: Date of birth; Time of birth, the weight and length of your baby. Send us a photograph as well and we will get a card sorted for you. This is a photo invitation design and will require a photo of your baby boy. You can find the no photo option here and the girl version of this card here. Your printable baby announcement will be personalised with your party details and photograph if applicable.